Homelessness is a known problem in Toronto and contributes to health inequities. 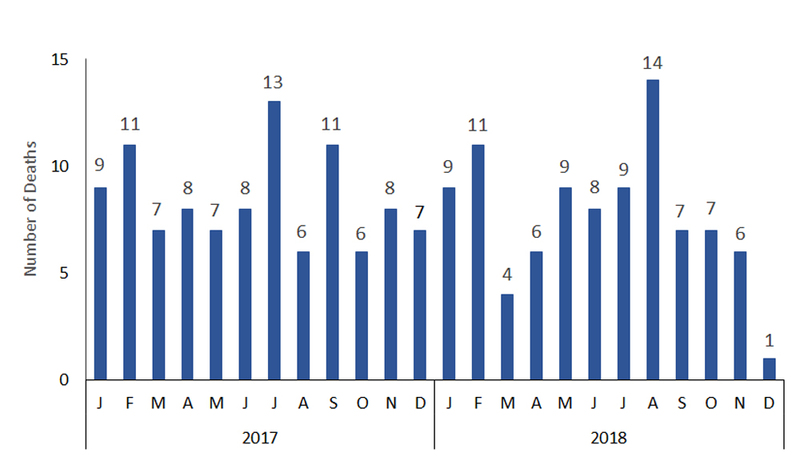 In partnership with our supporting agencies, Toronto Public Health (TPH) is tracking the deaths of people experiencing homelessness in order to get a better estimate of the number of deaths and their causes. Data is being collected for people who are experiencing homelessness and die while living at shelters, on the street, or at other locations in Toronto. This will provide solid evidence on which to base efforts to improve the health of this vulnerable population. Note: Due to the general lag time in reporting, monthly numbers are subject to change. 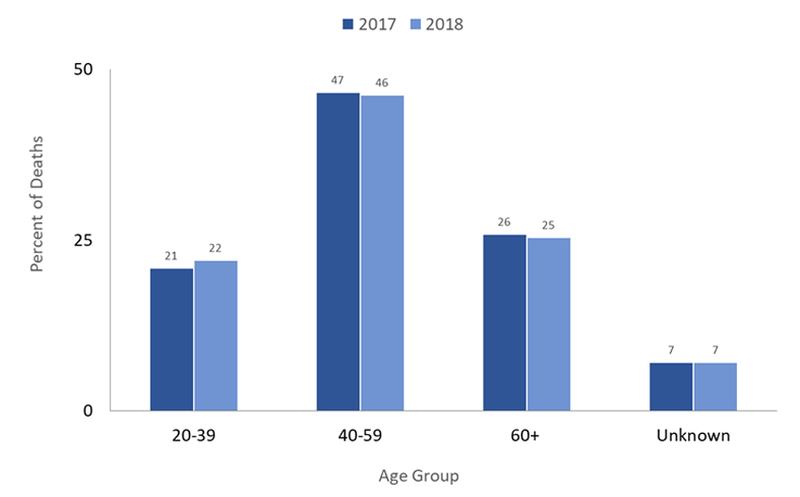 In 2018, almost half of the deceased (46%) were in the 40-59 year age group. This is consistent with 2017 which was 47%. 2017: Of the 101 deaths, 74% were male. 2018: Of the 91 deaths, 78% were male. * Results are derived from Toronto Public Health, Shelter Services and other data sources and are subject to adjustment as additional information or new reports are received. 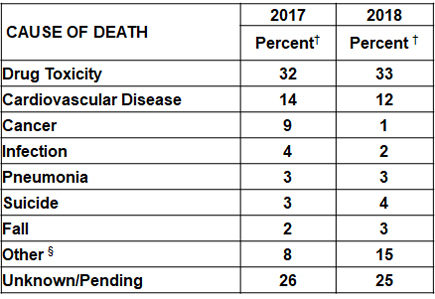 ** The life expectancy at birth for Toronto, 2015† Total may not equal 100 percent due to rounding.§ Other category for cause of death includes complications from diabetes, accidents and murder, among additional causes. Updates will be posted every six months. The situation of an individual or family without stable, permanent, appropriate housing, or the immediate prospect, means and ability of acquiring it. It is the result of systemic or societal barriers, a lack of affordable and appropriate housing, the individual/household’s financial, mental, cognitive, behavioural or physical challenges, and/or racism and discrimination. Most people do not choose to be homeless, and the experience is generally negative, stressful and distressing (Canadian Homelessness Research Network of York University). Thus someone who is temporarily staying with friends or family, or transitioning to new housing, but has experienced long periods without a permanent home, would be considered homeless. Why did TPH launch this initiative? Homelessness is a known problem in Toronto and contributes to health inequities. Previously, death data for people experiencing homelessness in Toronto has been limited to those who had been living in City-funded shelters. As a result, the full scope of this problem has been unknown. Through this initiative, data is being collected for people experiencing homelessness who die while living on the street, at a friend’s place, at a shelter, or at other locations in Toronto. Ultimately, the initiative will provide better data to help carry out this mandate and provide solid evidence on which to base efforts to improve the health of this vulnerable population. What are the recorded numbers from recent years? 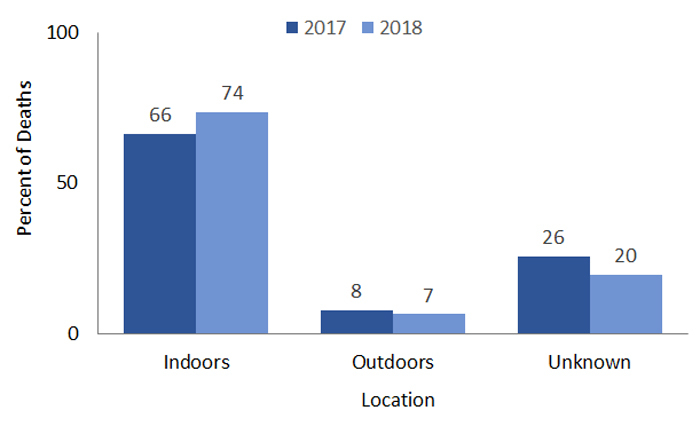 These numbers represent deaths reported to City-funded shelter residents and do not reflect the full extent of the issue. Who is participating in this initiative? Toronto Public Health is leading the initiative. Approximately 250 health and social service agencies that support people experiencing homelessness are participating in the initiative by sharing data with Toronto Public Health. The Office of the Chief Coroner of Ontario (OCCO) is also helping to verify some of the data. Toronto Public Health collects and analyzes the data, and reports the results on a regular basis. A secure, web-based form is available to participating agencies. Data collected by the form is downloaded by TPH where it is reviewed and verified with the assistance of the OCCO as noted above. Data collection for this initiative began January 1, 2017. We will evaluate the system going forward and may add additional data fields as needed. Individual-level data will be treated as confidential. Data is summarized and reported in aggregate form. Epidemiologically, the information will be used to gain a truer understanding of the number of deaths in the homeless community and potentially identify year to year, seasonal, geographic and other trends related to the population. The information will help raise awareness of these tragic deaths and respond with appropriate strategies to help improve the health of this vulnerable population, thereby helping to reduce health inequities in Toronto. Individual-level data is treated as confidential. When is the information made available? Updates are posted every six months. Additional reporting will be determined based on need and the results of the data. Information related to unofficial cause of death will be released twice annually in August and February to protect the privacy of the individuals concerned. Toronto Public Health’s Acting Medical Officer of Health Dr. Barbara Yaffe announced the new initiative to track deaths of people experiencing homelessness in Toronto at a media event on January 10, 2017. Watch the video clip below for details. For more information or to report a death of a person experiencing homelessness, please contact the Toronto Public Health Surveillance and Epidemiology Unit at 416-392-7450 or seu@toronto.ca. If the death is newly discovered, please call 911 first. When possible, reports received in a timely manner are most appreciated. All reports received by July 31, 2019 will be included in our next update.